Know what you teach aims to provide teacher educators with ideas for content when teaching about Aboriginal and Torres Strait Islander cultures. 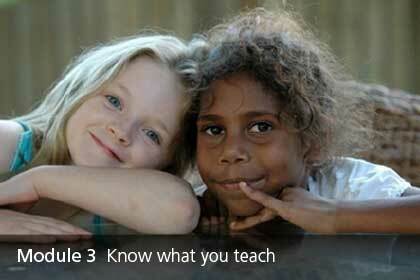 While specific events and examples are used in Know what you teach, teacher educators are encouraged to work with their local communities to draw upon further examples and model appropriate approaches to consultation, negotiation and the use of Aboriginal and Torres Strait Island peoples’ knowledge. Module 3 provides concepts, learning activities and assessment tasks to support the Australian Professional Standards for Teachers (Focus Area 2.4). Explore the four Module 3 topics below through the Topic Overview or Get Started links.